GARDEN VILLAGE, known as the "friendly home", is centrally located in the northern suburb of Bordeaux, Randburg. Some 210 people live in the village where the individual's right to privacy is respected but where there is a genuine warmth and concern for each other. A host of activities, entertainment and outings is available to cater for everyone's needs. There are 127 PFUs (Privately Funded Units), 15 rented units as well as accommodation for 60 people in our caring section. A caring and friendly atmosphere. A secure environment with 24 hour security guards. A well stocked tuck shop. Trips to places of interest or entertainment. Excursions to holiday venues such as game parks etc. A host of activities such as card games, gym classes, bingo, film shows and scrabble. Our own Chapel where Sunday morning and evening services are held as well as bible studies and fellowship meetings. Entertainment by way of visiting musicians and others. Lock up garages or carports can be rented or purchased on a life rights basis. A full laundry service or a self help laundromat. Doctors, physiotherapists, podiatrists etc. available in the village. Nursing services, not only in the caring section, but to all residents. A hairdresser and salon sponsored by the village. A weekly cleaning service included in the levy. 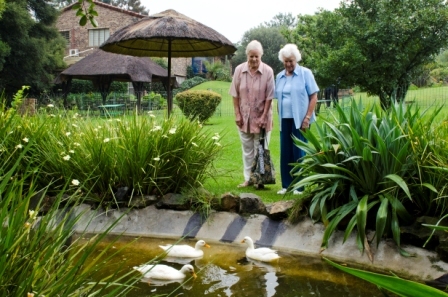 Garden Village boasts magnificent gardens and a quaint duck pond where you can walk or sit and enjoy a bit of country atmosphere. For the energetic you can join others in early morning or evening walks around the village. The 127 units comprise spacious bedsitters, 1, 2 or 3 bedroom units or cottages at prices ranging from R220 000 to R1 075 000 with monthly levies from R980 to R2 340. The units are owned on a life rights basis. 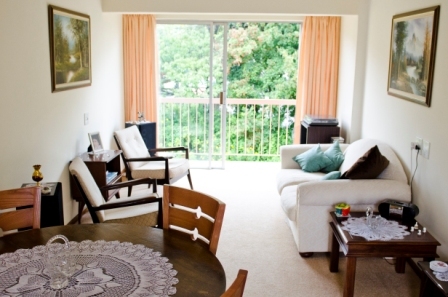 When a resident vacates a unit it is resold by the home. The resident is refunded a percentage of the sale price dependant on the number of years of occupancy. After 5 years it is fixed at 50%. The new selling price is market related and hence the refunded amount has often exceeded the original purchase price. The rentals range from R2 570 for a bedsitter to R4 095 for a very large 2 bedroom unit. 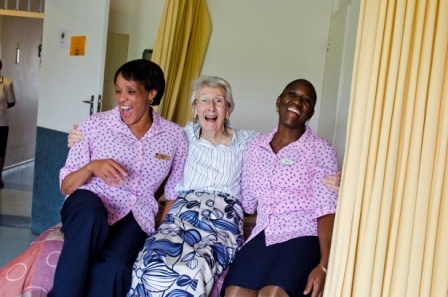 The caring section has both a frail care and mid care. A matron, sisters, professional nurses and care workers ensure that residents are well cared for and that their needs are met. Accommodation is on a full board basis including all meals, teas, laundry etc. A CCTV system has been installed in all rooms to enable nursing staff to continuously monitor the residents. Residents are also provided with a panic button. The mid care rooms each have their own bathroom and access to the gardens. The frail care residents make use of common bathrooms specially equipped to cater for patients who need assistance. An occupational therapist organises activities for these residents who are also encouraged to participate in all the activities of the folk in the village. There are rooms for singles and couples in mid care while in frail care there are rooms with 1, 2 or 4 beds. The monthly tariffs vary depending on the type and size of accommodation. There is a waiting list for all forms of accommodation. In the case of frail care, accommodation can sometimes be immediately available, while for those requiring large cottages the waiting period could be several years. Please come and visit us and let us show you around so that you can experience the ambiance and ask questions.